TECHZONE: Buffalo introduced MicroStation™ Internal SATA SSD's. Buffalo introduced MicroStation™ Internal SATA SSD's. 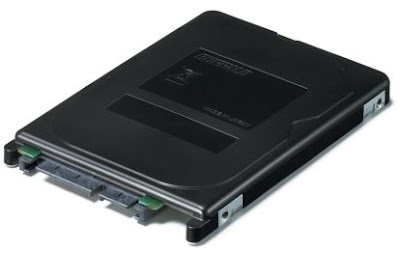 Buffalo Technology announced the MicroStation 2.5 inch internal SATA Solid State Disk Drives (SSD) for notebooks. These new SSDs are faster than the traditional HDD’s which results in better performance, faster response times and quicker access to data. SSD storage is robust as it has no moving parts, making it silent and perfect for portable use with laptops. The lower power consumption ensures that mobile workers get the best from their battery life, whilst the device’s read/write speeds are faster than traditional HDD. This allows users to benefit from better performance, faster response times and quicker access to data. The SSD's comes in four capacities (32GB, 64GB, 128GB and 256GB), and with a 64MB DRAM cache, the drive performance can reach 80MB/s read speeds for the 32GB model, and up to 240MB/s read and 190MB/s write speeds with the 256GB model. To further enhance the performance of the drive, the MicroStation™ Internal SSD also includes the Buffalo Tools suite of complimentary software, TurboPC and Turbo Copy, which help to increase file transfer and copy times. The MicroStation Internal SSD is available across EMEA. Tags: Buffalo MicroStation internal SATA Solid State Disk Drives, SSD's, internal SATA SSD's, internal SATA Solid State Disk Drives, Buffalo MicroStation internal SATA Solid State Disk Drives review, Buffalo MicroStation internal SATA Solid State Disk Drives features, Buffalo MicroStation internal SATA Solid State Disk Drives details, Buffalo MicroStation internal SATA Solid State Disk Drives images, Buffalo MicroStation internal SATA Solid State Disk Drives pics.